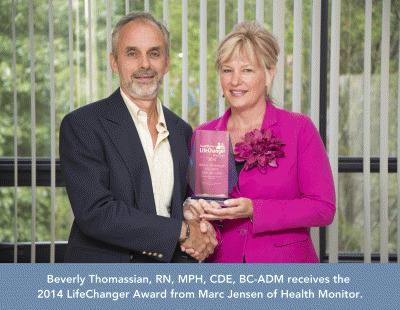 Beverly Thomassian is the recipient of the Health Monitor® Diabetes Educator LifeChanger Award. HealthMonitor.com is a leading online platform for health information available to the public and focusing on patients, caregivers and anyone interested in topics related to disease and health. They also publish a print magazine. Beverly was an obvious choice for LifeChanger of the Year Award as she also strives to provide trusted, helpful, user-friendly diabetes information and tools to her students, including health care professionals and people living with diabetes. Bev goes the extra mile though and works hard to make it fun!